All finalists received a trophy and certificate at the 2017 ProjectCSGIRLS National Gala. For my ProjectCSGIRLS creation, I chose the theme “a safer world”. According to the Bureau of Justice Statistics, in 2015, approximately 1% of people 12 years or older experienced at least one violent victimization, and 42% of them experienced at least one serious violent victimization. This means that for every 10,000 people in the United States, 98 of them had experienced a violent criminal act, which is an extremely disturbing number. These statistics are even more alarming for young girls, especially for those below the age of 24, including high school and college girls. I study in a large school district, with almost 2,500 girls in the middle and high school. As per the average statistics in the country, this means that about 24 of us may experience some sort of violent victimization in a year alone! This shocked me and I knew I had to make something which could reduce these numbers and provide an extra layer of protection for me and my friends. My product is called the Smart Earring, and it combines jewelry with safety. A button attached to an earring backer makes it easy to alert authorities of danger at any time. In order to make a button that can send out a text message, I used an Arduino with a connected ethernet shield. I also used the website Tropo.com to get a phone number for my Arduino to enable sending out text messages. The messages are sent using that website as well. I first coded the Arduino so that any time the code was uploaded, it would send a message to my phone. I then added a few lines of code, as well as some breadboard wiring, so that only when the button is pressed hard, the Arduino sends out a message to my phone. I then attached the button to a back of an earring so that the button on the earring could cause a message to be sent to safety authorities in case of an emergency. IoT (Internet of Things) based Wearable technology is a growing engineering revolution in so many areas. So, I decided to incorporate it into my ProjectCSgirls. My innovation is Temp which is an IoT based wearable strap that senses body temperatures through a temperature sensor. Utilizing the Raspberry Pi 3 and DHT 11 temperature sensor, I used the Python program (using Adafruit DHT Sensor Library) and I programmed it to sense the temperatures every 15 seconds(This time limit can be changed at the user’s desire). Once the received temperatures gets above 90 degrees, Raspberry Pi sends an SMS text message to the registered user. The user can connect their phone to receive the Temp Tracker messages and to monitor the historic stats. Even though many people don't see it, heat strokes are a growing problem all across the world. In places such as India, Africa, and even America, some people don’t have access to any type of cooling. They are faced with immense heat and they are not able to do anything about it. To add, many pets and kids are left in cars and outside everywhere, and they are hit with the life-threatening heat. These temperatures can rise in just minutes. Using the Temp Tracker, which is efficient, cost-effective, and convenient, people can be alerted about when they must receive help. This idea can branched out even more by also connecting nearby hospitals and NGAs (volunteer organizations) into letting them know when to respond in need of help. Wearable technology can be very useful to the user and can be very effective in everyday life. Many people have used this in different fields, so I decided to use it on the medical side. I placed my project in the theme of Intelligent Technology because it uses a branch of technology (wearable technology) to take care of a problem. After talking with an AWS (Amazon cloud) correspondent, I worked referencing their programs and IoT technology to program my device. I was able to utilize AWS partner TextMagic API to send the message, which goes through them. As one can see, heat strokes are a developing problem everywhere. Encompassing this device in studies will help many people using it to take care of the problem first hand. Most visually impaired people have walking sticks, but do those sticks really help detect obstacles in unfamiliar environments? The Visually impaired need an affordable technology solution that will help them detect obstacles such as; steps, sidewalks, uneven surface, and holes. Recent computer vision technology could be applied to make visually impaired life safer and the technology solution affordable. I’ve developed a detection system that uses a smartphone, a regular stick for the visually impaired, and a smartphone holder. Assuming the system is relying on an existing stick and smartphone, the only extra cost for the users will be for the smartphone holder cost (~$5). First, the visually impaired user installs the app on their smartphone. Then the user puts the smartphone on the holder. The user should feel where the home button is and put it on the top (upside down). This is because of the angle that the pictures have to be taken from. Then the user starts walking and occasionally gets close to an obstacle. The algorithm inspects the scene in real-time aimed to detect steps, uneven surfaces, sidewalks, and holes. It detects edges in the images and measures distance to the obstacles. Throughout all of this the app is taking a video of what is going on. If it’s a hole or sidewalk the smartphone would vibrate once. If the app detects stairs or uneven surface, the smartphone would vibrate twice. Detection of a larger range of obstacles. The system could be extended into a social network where each user contributes data on obstacles. Over time, this will create a foundation for more accurate obstacle detection (like Waze app but for visually impaired). The inspiration for this project comes from a desire to find a better way to prevent barnacle growth on marine vessels than the current method available. The most common method for preventing barnacle growth today is to paint the hull of the boat with a paint called anti fouling paint. This paint is made of many toxic materials that are detrimental to the environment. Anti-fouling paint is a very heavy paint which means it puts extra weight on the boat. So, the boat’s engine has to put extra effort into pushing the boat through the water. This can also damage the environment. Not only does anti fouling paint hurt the environment and damage the boat’s engine, it is also very expensive. The price range for a gallon of this paint ranges from $30-$200. Multiple gallons are typically needed to cover the bottom of a typical boat. For these reasons I am going to try to create a cost effective and an environmentally friendly device that will still do the same or better job at reducing barnacle growth on marine vessels thus making our waters safer and improving Global Health. To do this I have decided to use an ultra-sonic speaker, also known as a Piezo electric speaker. This speaker is meant to produce such high frequencies that an almost perfect human ear would not be able to hear. But how is this speaker able to do this? A regular speaker converts electricity to motion by causing the magnet and coil inside to repel and attract at a certain speed. But to make a higher frequency the speaker must have less mass. So, scientists discovered that a higher frequency could be made by directly sending electricity to a Piezo element with no magnet or coil. This speaker can produce sounds higher than what the human ear can hear (more than 20,000 Hz). Unlike the study done in year 1, this year three different sized ultra sonic speakers will be tested. In one sample, 15 small Piezo electric speakers will be used, another with 3 medium ones, and the last arrangement will have one large speaker. Four tiles of plexi-glass will be left in the water for two months for each trial. They will be weighed prior to submerging. The assigned Piezo electric speaker arrangement will be attached to rectangles of plexi-glass and placed into the canal. Each Piezo electric speaker is programmed to emit the same frequency. The three arrangements have speakers that will scan through frequencies between 30-40 kHz. The idea of having a speaker that scans through different frequencies came about because there might be a possibility that different organisms stop growing at different frequencies. This was proven to be correct in the study conducted in year 1. There will also be one sample of plexi-glass without a speaker arrangement as a control. After approximately 2 months, the 4 arrangements of ultrasonic speakers will be weighed and compared to when first placed in the canal. Throughout the experiment the submerged samples will also be visually observed on videotape using a waterproof video camera. Higher volume of 911 calls coupled with growth of overall population. Declining funding from cash-strapped local counties and states. An estimated 240 million calls are made to 911 in the U.S. each year. In many areas, 70% or more calls are originated from wireless devices. This mind boggling volume of calls stretches the emergency systems to the brink that ultimately pushes up the time it takes to respond to incoming requests. It is also estimated that about 15% of 911 calls are made for non-emergencies. While average 911 response times are heavily disputed, the American Police Beat estimates the average response time for an emergency call at about 10 minutes. Imagine not being able to receive critical care or first aid during a time of emergency. Those precious minutes spent waiting for First Responders to arrive on the scene could be the difference between saving the life or resulting in death! I want to help reduce the stress on the over burdened emergency response services and in turn decrease the time it takes for emergency services to arrive when a 911 call is made. To solve this I have invented a system called Peer-to-Peer Emergency Response System (PePERS). A 911 call initiated via a smartphone will be routed to a conventional PSAP as well as the PePERS system. PePERS utilizes a nationwide network of users who via their smartphones are able to identify other users in need of emergency services and are able to rush to their help before conventional First Responders arrive at the scene. Help save lives by reducing the amount of time it takes for a 911 caller to receive help. This will especially be the case in rural / less populated areas. Reducing the amount of time spent by conventional First Responders on non-emergency calls. Increasing awareness of local emergencies to a wider audience and by building a community of users who care for each other in times of crisis. Preserving scarce First Responder resources at the state and the county level that can be diverted to better use. Every year, about 42.5 million American adults suffers from some type of mental illness, like alzheimer's, depression, and dementia. These forms of mental illness cause people to forget items or names and cause confusion among patients. The number of Americans living with Alzheimer's disease is growing fast. An estimated 5.5 million Americans of all ages have Alzheimer's disease. Wouldn’t it be amazing if we could make something to help these patients remember their important items? This got us thinking about making a low-cost, efficient, small and easy device for patients, travelers and kids to use. It became the genesis of our device that reminds and alerts us of forgotten items. This is in the category of intelligent technology. Intelligent technology is “the application of scientific knowledge for practical purposes, especially in industry.” In one scenario, imagine an Alzheimer's patient going on a trip for a week. But they forgot their medication. The medication that needs to be taken everyday. This could be very risky for someone with that disease. To prevent situations like this from happening, the backpack that we have created will remind users what they have forgotten. Of course this doesn't mean it can't be used by anyone. In another scenario, imagine a businessman might have an important appointment to which he is flying to, and he might forget his passport or reaches his destination and realize they have forgotten the notes for their meeting. This backpack we have created will help avoid accidents like that and will help provide a sense of security. ur software is preprogrammed with a list of card UIDs that can easily be changed by the user. There is also a “trigger card” which is used to start scanning the regular cards. The regular cards are scanned using the RFID reader and their UID sequence is saved. Once all the regular tags are scanned, the trigger card must be scanned again in order for the computer to know that the items have stopped being scanned.This list of scanned cards is compared with the list of total cards. This new list is the output which is displayed on the LCD screen. These tags can be placed on almost any item Alzheimer's patients might forget. Living along the borderland, it comes to no surprise that illegal immigration is a common topic in a conversation. One can always find inspiration by listening and watching their surroundings, which in effect is what ultimately led to what my work would focus on. This topic, though, doesn’t only revolve around the American-Mexican borderline, in has an impact all across the world, whether in politics or being an illegal immigrant yourself, which is why I believe my project has a crucial effect. There are many people who are generous, creating shelters for those who are on their own searching for a better life. These shelters, though, sometimes lack resources such as food and blankets. This is partially due to the fact that the country keeps on receiving more and more people coming in at a very fast rate. As of 2012, there were 11.4 million illegal immigrants in the United States. Imagine how many more we currently have as of right now! My project, which goes by the name AidingImmigrants, has taken the theme “A Safer World”, and is an application where people can find data about these refuges and contact those places that the user has taken interest in to send donations. This way, these shelters won’t be lacking common necessities and will have donations coming in. AidingImmigrants has very basic functions, making it extremely accessible for anyone. The app allows a user to select a city, which will show the shelters within that area. From there, you receive the address, website, phone, and map of the refuge the individual selected. The map is shown through Google Maps, which is done by using a component that starts it. AidingImmigrants was created through the block code program MIT App Inventor, and it has the goal of aiding those who want to aid. Evolution of cloud technology is a game changer in meeting the society’s major challenges. Twenty years back the mobile applications and cloud technology was in its infancy and the potential was hardly known. Cloud computing was initially considered as an infrastructure for the big enterprises to meet their computing needs. Slowly and steadily the public shift started happening towards cloud for the masses, to tackle the everyday needs and common problems. The power of cloud combines the ideas of the masses with unparalleled research and computing power. It started with salesforce.com and followed by Amazon web services and then the cognitive research and APIs offered by Microsoft and Google platforms. One area of application which could bring the power of cloud to the masses is the Mobile Application. IOS started in 2007, that began the era of smart phones in the mobile market and downloadable application. Since then we have more than 750,000 applications in both IOS and android which revolutionized the mobile market place. Our idea focuses on the theme of combining the power of cloud with mobile application for the cognitive services to meet the demands of common goal of betterment of society. A world without experiencing and learning from the visual perspective is a life unimaginable. From the young age to adults, we feel and interact with the surroundings through our eyes. When the same vision gets impacted through the age or any other way, the feeling of despair and the way it leads to dependent living is hard to describe in words. We felt the same when we encountered the old age people with impaired vision and our few of our school mates as they go through struggle starting from daily navigation to recognizing the known faces and surroundings. The day to day task which we take it for granted has suddenly become very difficult and the level of dependency makes them feel isolated and feeling of depression prevails. Our idea is to use a mobile app, the power of cloud and its associated industry leading machine learning and cognitive services offered by the providers. The current options include voice recognition and Braille reading, but nothing can come close to analyzing the images and interpreting the results. A few years back, this wasn’t even possible, but the level of advancement in cloud technology, internet connection speed and mobile network makes it possible. Our mobile app, created through MIT app Inventor, allows tracking the navigation through location sensor, remembering the places visited through the MIT Tiny DB, analyzing the surroundings through Microsoft Vision Cognitive services and recognizing the known people using Microsoft Face services. The Amazon web services cloud infrastructure provides a convenient means to host the PHP web service in their EC2 computing instance which can interact with cloud cognitive services. The importance of children’s mental health is widely known. After all, this health does not only affect children in the present, but has a dramatic impact on their future lives. Through the process of behavior modification, my project, Auto, improves the developmental health of children by allowing them to teach themselves self-control, self-reliance, focus and stress management strategies, and the consequences of their actions. I choose the name Auto for this project because auto is a Greek prefix meaning self. The main goal Auto is to allow young students to learn necessary qualities that will help better themselves in the classroom. I used an Arduino Uno, two PIR motion sensors, a microphone, and LEDs to make my project. There are three components to Auto: the motion sensor, the sound sensor, and the breathing technique applier. For the PIR motion sensors, the P in PIR motion sensors stand for passive infrared, passive meaning not using outside energy and IR stand for infrared, the type of energy it detects. This sensor has a fresnel lens that focuses the infrared onto the pyroelectric sensors, the part that does the sensing. The sensors are placed in opposite ends of Auto, essentially creating a space where the child should stay between. The microphone converts the sound waves into energy waves. When there is either motion or sound detected, the corresponding green LED will be given low energy, turning it off, and the red LED high energy turning it on. Auto’s other component is a breathing technique called pursed lips breathing. If either motion or sound is found, the breathing sequence begins. This helps relax and refocus the child, which allows Auto to not only let the child know that there is an issue with their behavior, but offers a solution to it. Also, Auto has a 98% success rate for all its components combined and only had one-false positive response when tested. I hope that in the near future, Auto will be implemented in schools, so the older generations can use this to help fulfill their responsibility to aid the younger generations to the fullest extent possible. Imagine a world where there are no reliable energy sources, where the ice caps are melting, and cities are flooding. Do you want this world for your children, or your children’s children? We have chosen the theme of “Global Health” to address the lack of clean, reliable energy sources and the substantial amounts of carbon dioxide in the atmosphere. As the population and our energy consumption rises, the need for a revolutionary, renewable, clean energy source becomes greater still. At the same time, dangerous carbon dioxide is being emitted in the air, causing global warming and havoc throughout the world. 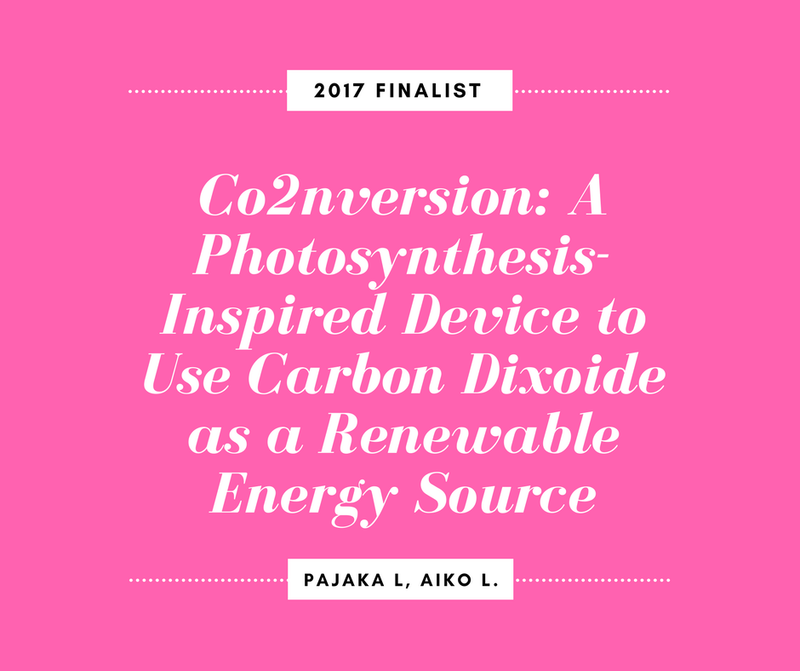 Our (theoretical) solution to combat the energy crisis and global warming, called Co2nversion, is based on photosynthesis—specifically, the conversion of CO2 using sunlight and catalysts. It is aimed to remove carbon dioxide from the air and provide renewable energy by combining carbon dioxide with hydrogen molecules from water in order to create formic acid, a renewable energy source. This device is comprised of many aspects to ultimately convert CO2 and water into energy. First, it has two chambers, similar to Photosystems I and II, connected by a channel: Cell Reaction Chamber I contains silica microporous material, much like a sponge (so we can have more surface area), infused with a base of manganese oxide and sodium with water, and Cell Reaction Chamber II contains cobalt and carbon dioxide. When sunlight hits our device, we use a slit, lenses, and parabolic mirrors to concentrate it so it is strong enough to trigger a reaction in each cell reaction chamber by making the sun coherent and collimated. Cell Reaction Chamber I uses the heat from the sunlight, whereas the Cell Reaction Chamber II uses the light. The concentrated light acts as a makeshift “laser,” and when it hits Cell Reaction Chamber I, an electron transfer will occur in the manganese oxide (a heterobimetallic catalyst). This means it will begin to shuttle sodium ions in and out of the water, splitting the water under the high temperature of the concentrated sunlight and creating one negatively charged oxygen atom and two positively charged hydrogen atoms. The oxygen is released back into the air, and the hydrogen is left needing something negative to grab onto in order to make it stable. While all of this is going on, another reaction will be happening at the same time in Cell Reaction Chamber II. A monochromatic, bandpass optical filter turns the concentrated sunlight into something that closely mimics a blue laser. This light would trigger an electron transfer between the cobalt and carbon dioxide that would cause the carbon dioxide to become negatively charged. The hydrogen will then move through a semipermeable membrane in a channel connecting the two chambers. Now in Cell Reaction Chamber II, the hydrogen atoms will latch onto the carbon dioxide to create liquid formic acid (CH2O2). Finally, when a pressure valve in Cell Reaction Chamber II notices a change in pressure as the two gases make enough liquid, a “trap door” would open and the formic acid would be released into a third chamber lined with palladium nanoparticles. The palladium nanoparticles catalyze the conversion of the formic acid, and it creates a fuel cell much similar to a battery that you can charge your phone with it. The innovation behind Co2nversion is that it is an efficient, portable, stable, energy-dense, affordable, rapid, renewable, clean energy source created only on elements we have an excessive amount of. The beauty of our innovation is that it solves not one, but two issues - the problem of carbon dioxide in the air causing global warming and the lack of clean resources. Considering the impacts, we believe that our solution will save lives, save costs, protect our growing livelihood and dependence on fuels, and most importantly, result in a world where our children can live safely and happily for the rest of time.